Bass. The most sought after of all the game fish. Its appeal spans cultures, age groups and genders to tap on the heart strings of anglers everywhere. Dan Westfall with a nice bass. Bass are very aggressive feeders and agile enough to easily chase down and catch most of their favorite foods. They are most easily caught during a feeding spree but can be enticed into striking an anglers bait for reasons other than hunger. They are predatory by nature and at times will strike at anything that enters their world. If it moves and they can get it into their big mouth, bass will attempt to eat it. 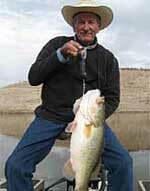 The most popular bass are largemouth and smallmouth. In certain areas of the country there are other species of bass including spotted (or Kentucky) bass, redeye bass and shoal bass. Also known as bucketmouth, this fish has a mouth that opens wide enough to swallow its own head. It will attempt to eat virtually anything it can catch and swallow. Growing to well over 20 pounds, it is much bigger than it's cousin the smallmouth bass. Click here for details on fishing for largemouth bass. Click here for details on fishing for smallmouth bass. Spotted bass are often called Kentucky bass, Kentucky spotted bass, Alabama spotted bass and Kentucky spots. They have a smaller mouth than the largemouth, so use lure sizes similar to smallmouth tackle. They feed on smaller fish as well as insects, crustaceans, frogs and worms. Closely related to the spots, it is often misidentified as a redeye due to the red coloring in the eye. The coloring is brownish similar to smallmouth. Fish for shoal bass as you would most bass and, as the name implies, look for them to congregate on shoals and similar structure. The redeye bass looks very much like a largemouth with a red eye and red coloration in the tail. Found in the southeast part of the US it is often confused with the shoal bass, because of the red eye. Fish for the redeye with conventional bass tackle favoring smaller baits and lighter tackle. If you like to fly fish, try fly fishing for redeye bass. Bass fishing information by state. The purpose of the page is to provide specific, detailed information about fishing for largemouth bass and smallmouth bass, plus information other bass including spotted bass, redeye bass and shoal bass. Our goal is to help you make your bass fishing trips more successful. Use the state navigation on this page to locate specific information about bass fishing in your local waters. If you have information, articles or photos related to bass which you would like to see published here, please submit them for consideration. We will gladly give you credit for your contribution. 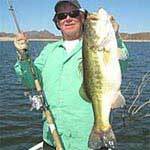 Bass articles can be listed under the general bass category on the primary fishing article page, or can be listed under bass articles in a specific state. Bass Fishing - All About Fishing for Largemouth and Smallmouth Bass.